On her dad's 50th birthday, Princess Leonor gave Spain's royals an invaluable present - the best day they've had in months. As the heir to the throne was presented with the collar and insignia of the Toison de Oro by her proud dad, she gave everyone a hint that the magic that's got the Borbons out of more than one corner is alive and well in the new generation. Leonor is a star in the making. There was nothing not to love about the whole ceremony which lasted less than half an hour but gave Spain's ruling house a boost that might well keep them going for months if the wind is favourable. Leonor, now 12, was awarded the Toison de Oro back in 2015 but the presentation was saved until now. The Toison de Oro is the highest decoration the Spanish monarch can award. It was founded in 1430 by Felipe III (also known as the good) and Leonor is one of just a handful of royal women to receive it so far. Just to ramp up the historical a bit more, the insignia Felipe handed to his heir once belonged to Juan, Count of Barcelona, father of King Juan Carlos. On the day her dad reached half a century, Leonor put out all the vibes that she's got every intention of making sure the monarchy lasts much longer than that. We don't get to see the Princess of Asturias and her sister, Infanta Sofia, that often so no one was really sure how the ceremony would unfold. The answer came almost as soon as the royal party arrived in the Royal Palace in Madrid. Leonor was very smiley, very confident and very much a daddy's girl. After Spain's national anthem was played, she stepped forward with her dad to receive the Toison de Oro. 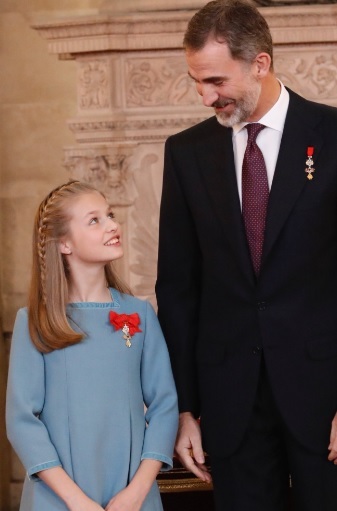 Felipe VI looked after his daughter very well but then she went and stole the show with a proper, full on curtsy that added all the stardust to an already special event. Leonor wasn't done yet. Dad was left behind as she kissed her mum, Queen Letizia, before curtsying again. There was a hug for sister Sofia before more curtsies for her grandparents, King Juan Carlos and Queen Sofia. And then the queen in waiting really hit her stride. She worked the front row of guests like, well, a queen in the making as she hugged her maternal grandparents then warmly greeted the other current Spanish holders of the Toison de Oro before stopping to make a proper fuss of her great aunt, Infanta Margarita, and aunt, Infanta Elena. Dad was on hand to guide her back to her seat before making a very emotional speech which ended with a promise that her family would always support her and that he was very proud of her. Tissues all round. Leonor really was just so accomplished through the whole ceremony. If she was nervous, she hid it well and her clear joy in sharing a special moment with her father was evident. 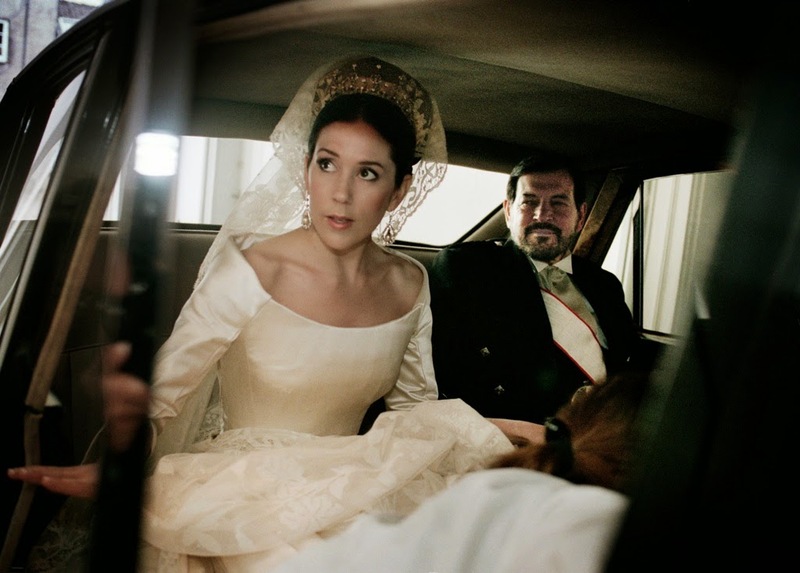 The fuss she made of her grandfather, King Juan Carlos, also added a special touch to the whole proceedings and the Borbons looked more united and more confident than they have done in quite a while. And to end, the Princess of Asturias excitedly hung back to take her place with her equally smiley sister as the royals all left. This was as good a day as Spain's royals have enjoyed since the State Visit to the UK back in July 2017. 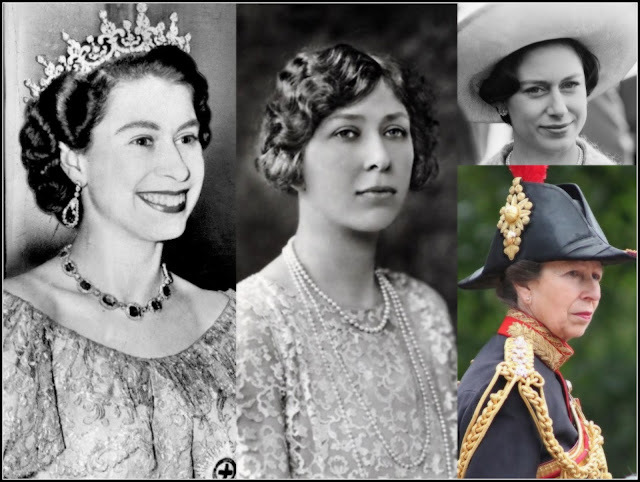 Right now, their destiny is very much up and down but today's ceremony showed that if the current storms can be weathered, they have quite a queen waiting in the wings. Leonor really is a new royal superstar in the making. #RoyalVisitSweden: the state of things to come?